Edmund G. Kaufman was a General Conference Mennonite missionary to China (1917-1925) and president of Bethel College, Kansas (1932-1952). He was the son of John P. and Carolina Schrag Kaufman and grew up in the Swiss-Volhynian Mennonite community near Moundridge, Kansas. He earned degrees at Bethel College (AB, 1916); Witmarsum Seminary, Bluffton, Ohio (AM, 1917); Garrett Biblical Institute, Evanston, IL. (BD, 1927); and the U. of Chicago (PhD, 1929). He was a vigorous teacher, administrator, churchman, and intellectual leader. Kaufman was a progressive. He endeavored to lead Mennonites out of sectarian isolation and dogmatic narrowness into wider arenas of service and mission. In China where he served as superintendent of the Mennonite Mission School at Kai Chow (Puyang), he pioneered in blending Chinese cultural elements with the Western-style Christian marriage ceremony. By training leaders and responding to their need for cultural authenticity, he helped pave the way to independence for the national church. He arranged for two Chinese Mennonite leaders, James Liu and Stephen Wang, to study at Bluffton College and Bethel College in the United States. Kaufman became president of Bethel College during the economic depression of the 1930s. He strengthened the school through faculty recruitment, a building program, financial drives, and a revised curriculum. In 1938 the North Central Association granted accreditation to Bethel. Kaufman enhanced the Mennonite identity of the college through development of the Mennonite Library and Archives and the Kauffman Museum. His commanding presence on campus was expressed in chapel services, in his required senior course in Basic Christian Convictions, and in his rigorous attention to the details of college activities. Mennonite Fundamentalists and traditionalists criticized Kaufman's liberal ideas, his studies at the University of Chicago, and the assumptions of human progress in his publications, such as his PhD dissertation, The Development of the Missionary and Philanthropic Interest among the Mennonites of North America (1932). After resigning from the presidency at Bethel, he wrote or edited six additional books, including Living Creatively (1966), Basic Christian Convictions (1972), and General Conference Mennonite Pioneers (1973). Kreider, Robert S. Editor. "Edmund George Kaufman: Autobiographical Reflections at Seventy-nine." Mennonite Life 42 (March 1987): 39-45 and 42 (June 1987): 17-18. Warkentin, A. and Melvin Gingerich, compilers. Who's Who Among the Mennonites. North Newton, KS: Bethel College, 1943: 133. Juhnke, James C. "Kaufman, Edmund G. (1891-1980)." Global Anabaptist Mennonite Encyclopedia Online. 1987. Web. 20 Apr 2019. http://gameo.org/index.php?title=Kaufman,_Edmund_G._(1891-1980)&oldid=121187. Juhnke, James C. (1987). 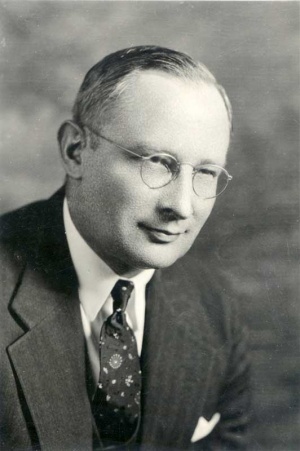 Kaufman, Edmund G. (1891-1980). Global Anabaptist Mennonite Encyclopedia Online. Retrieved 20 April 2019, from http://gameo.org/index.php?title=Kaufman,_Edmund_G._(1891-1980)&oldid=121187. Adapted by permission of Herald Press, Harrisonburg, Virginia, from Mennonite Encyclopedia, Vol. 5, p. 484. All rights reserved. This page was last modified on 13 April 2014, at 21:13.